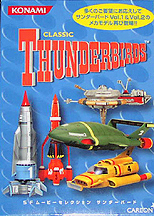 This is the Thunderbird Collection made by Konami. Most of these plastic candy toys are 4"long and require some assembly, the pieces simply push together. Each vehicle is prepainted and ready to display. This is a 4" long Thunderbird 1, it features positionable wings. Here's the Thunderbird 2, it's cargo pod is removeable. 4" long. This is the Thunderbird 4. You can adjust it's plow, 4" long. 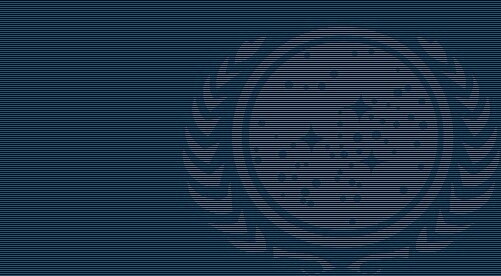 The orbiting station, Thunderbird 5. The Firefly, is 4" long and has a movable plow. Another Thunderbird venicke, the Mole. You can show it on it's crawler or ready to dig. The Mole itself is also removable. 4" long. Here's Lady Penelope's car, the FAB 1. Lady P is inside and Parker is at the wheel. 4" long.. Here's the Fireflash. 3 scale Elevator Cars are included. 4 1/2" long. Here is a larger version of the Elevator Car, 4" long. Here is rescue vehicle, the Helijet. It's 3 1/2" long. This is the 4" long Recovery Vehicle.